Although there are many schools of thought when it comes to marketing, there’s one thing that most marketing professionals can agree on: Planning and strategy are the foundation needed to make a successful marketing plan. If you’ve read our previous article about DRM’s Pyramid of Marketing concept, you should be familiar with the basic timeline in which a marketing plan should be implemented. By separating your marketing plan into separate ‘phases’, it becomes easier to build upon the tactics you’ve already implemented and work towards accomplishing your brand’s business goals. Of course, working towards building a comprehensive strategy requires a lot of research and planning. Below we will take a look at the Strategy Phase of the Pyramid of Marketing and discuss how planning and research contribute to your overall marketing plan. A good place to start your research is to consider your brand’s current Marketing Mix. This is a term used to highlight the entire process of bringing a product or service to market. Your Marketing Mix is typically composed of something called the ‘4P’s of Marketing’. The ‘4P’s of Marketing’ are composed of Product (Or Service), Place, Price and Promotion. Reviewing each component of your brand’s marketing mix can help you see where your current strategy may need to be tweaked. First of all, you must consider your product (or service) itself. A company’s full range of products or services are called a Product/Service Mix. How are your products or services branded? What features do they have? How do they differentiate from your competitors? How are they perceived in the grand scope of your industry? These are all questions you should be asking. After all, the what of your marketing strategy is just as important as the how! Providing the best possible products or services are your first step to accomplishing your business goals. Think about it: the more competitive your Product/Service Mix, the easier they should be to sell. The next part of your marketing mix to consider is place (or placement). This deals with how your product or service is distributed. Believe it or not, how your product or service is sold is very important to today’s consumers. Does your industry typically sell online or through a retailer? How easy is your product or service to purchase and use? Paying attention to the distribution methods of your competitors and the expectations of your customers can help your brand be even more competitive in your industry. For instance, look at how Amazon is completely dominating in the retail space. Their placement within their industry has a lot to do with their success. Another important factor of your product or service to consider is the price. You may be thinking that the lowest priced good or service will automatically win over the competition. While this can be true for some types of products, this is certainly not always the case. Studies have shown that 80-90% of all poorly chosen prices are too low. While low prices can lead to increased sales, if a price is too low, it can actually devalue your brand in the eyes of consumers. Striking a balance between affordability and profit is key for most products or services. Even if you intend to price on the higher end of the spectrum to show that your product is higher end, it’s important to do the necessary research beforehand to ensure that the market is there. After considering the first three parts of the 4P’s of Marketing, we finally get to the part you’ve all been thinking about – promotion! Obviously, this part of our exercise has to do with the actual marketing strategy behind your product or service. While there is still a lot to consider in this phase of the Pyramid of Marketing before we start working on a marketing strategy, it is important to research how your competitors are promoting similar products or services. Seeing what the competition is doing and reviewing how their tactics are received can provide actionable information for your brand. In most cases, it can be useful to do marketing research beyond a simple competitive analysis. Depending on your situation, creating a marketing research strategy can help you gather actionable data and further refine your marketing plan. When gathering data, there are typically two ways you can go about it. It is wise to first look for pre-existing data, statistics and studies to save yourself some legwork. If the research you seek has not already been done, you can then start putting together a research strategy of your own. For some companies, doing their own research studies can be difficult. Luckily with the advent of the internet age, we have a myriad of information at the tip of our fingers. When looking for specific studies or data, it is now easier than ever to find pre-existing studies done by research firms or government agencies. For general data, there are several public sources such as the U.S. Census Bureau and SBA Office of Advocacy that publish their own studies publically. There are also large market research firms such as Nielsen that sometimes provide stats online that can be useful to your industry. Industry blogs can be a useful place to look for useful information pertinent to your research. Of course, not all information is free. Market research firms often will require payment for certain studies or reports. If the information is valuable to your cause and can save you from having to do your own research, buying reports can sometimes be worth the investment. Of course, if the information is not already out there, you may have to do your own market research. Your research can start as simply as creating a simple online survey or as complex as holding a series of focus groups. Luckily there are numerous tools for starting your own research available. Hubspot has a great list of 17 marketing research tools and resources for starting your own marketing research. One of our favorite tools for getting started is is SurveyMonkey. This is a free-to-start survey creation service that allows users to create in-depth surveys and send them out to their own email lists. When crafting a survey, there is a lot to consider in order to get the best results. Qualtrics has a great article about how to build an effective survey. Keep in mind that how you analyze your data is just as important as its actual collection. If data is skewed, it can sometimes be difficult to draw direct conclusions from. Holding a focus group is another effective way of conducting your own market research. A focus group is a small group of people whose reactions and thoughts in regards to a certain topic are studied and cataloged. A focus group generally collects a diverse group of people (as to prevent data from being skewed) and will gather their feedback about a product. Focus groups are typically run by a dedicated moderator that asks questions to the group in order to collect useful information. Focus groups are a great way to gather consumer feedback about your product before bringing it to market. Building a Buyer Persona can be a useful strategic exercise that marketers use to better understand their target audience. A buyer persona is essentially a fictional person that epitomizes your ideal customer. Buyer personas can help you better understand your core customer groups, build out advertising demographics and maximize the effectiveness of your marketing campaigns. Think of a buyer persona as an extremely detailed demographic. Sally has always had a great appreciation for the culinary arts. After working many years in the service industry as a chef, she decided to take open her own restaurant. She is now the sole proprietor of a restaurant chain with three locations across Northeastern Ohio. Sally’s business has gained great success over the years and she hopes to expand in the future. While Sally is very business savvy, she is also very busy. She handles much of the marketing for the business on her own and she sees herself being stretched very thin. While Sally has never worked with a marketing agency before but is open to working with another company to help her business grow and expand. Creating a detailed buyer persona can help you more easily design your marketing campaign around how to best reach your target audience and cater to their needs. Putting yourself in the mindset of your target audience can be a big challenge for business owners and creating a buyer persona can help with this process. After doing a full competitive analysis and proper marketing research, you have successfully completed the first level of the Pyramid of Marketing. Everything we discussed above helps to create a baseline knowledge that your marketing strategy can be based upon. Marketing research and competitive strategy are very important to the campaign building process. Without doing the proper legwork, it’s very easy to go in the wrong direction with your marketing. 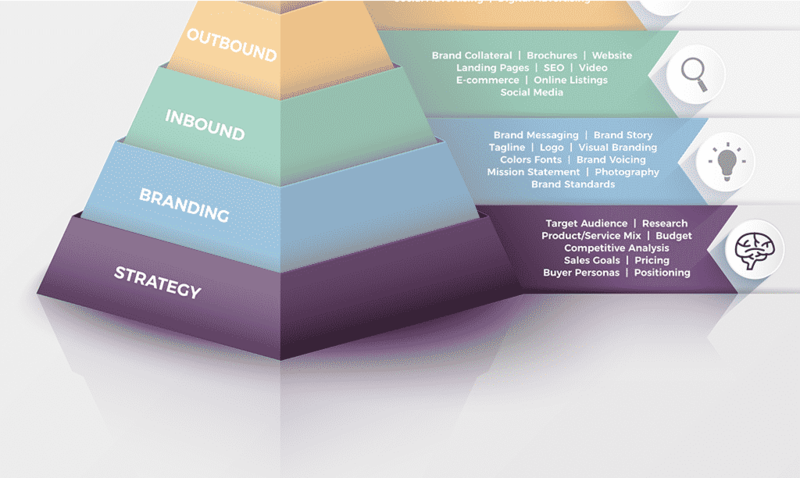 As we have previously mentioned, the Pyramid of Marketing was created to help companies build their marketing strategy in the correct order. In the third part of our “Pyramid of Marketing” series, we will discuss what goes into creating a brand strategy for your company. If you need help growing your business, give DRM a call! We are a full-service marketing agency based in Cleveland, OH and specialize in services such as web design, branding, graphic design, video production and digital advertising and more! We help businesses of all different sizes and industries so don’t hesitate to reach out to us. Give us a call at (216) 245-0835 to speak with a member of our team about any marketing questions you may have.